Tenuta la Santissima is part of an old hamlet and first descriptions of the inn date back to the 13th century. The inn was a meeting place for pilgrims and it preserves his history of welcoming. 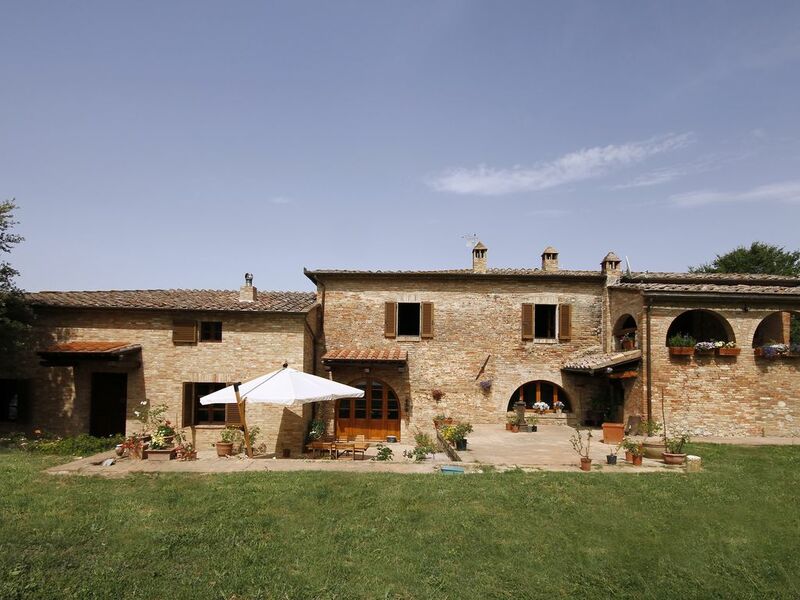 Located a few minutes outside Siena, Tenuta la Santissima is a B&B surrounded by nature. Enjoy the beauty and peace of nature from your room, go out for a walk in the surroundings or make a trip by bicycle. Tenuta la Santissima is only 5km away from Siena. Here you can combine relaxing moments in our Hotel, with pleasant tours in the city and its surroundings. If you wish you can enjoin the lifestyle of these places, contemplating or taking part to the activities in vegetable gardens and in the farmland. Back from visiting monuments and villages, enjoy the traditional dinner with the family. Everything is prepared with our organic natural products. Let yourself be inspired by the peace and beauty of the genuine Tuscan countryside. Each room has free WIFI and air conditioning. Check in is at 15:00 , check out at 12:00 but if you need you can come before to leave your baggage. We would like to inform you that you can also have dinner. My mother will prepare lots of things, all organic vegetables are produced by us. Dishes are usually typical of Tuscany. Drinks are all included (Chianti wine, water etc). Usually people that have the dinner repeat the experience the day after! People normally like to have dinner with my family, but you can also stay alone. If you decide to have dinner the first day please reserve some days before, for the other days you can reserve at your arrival! We offer cooking class , only upon reservation. Also, on our website, you can find the GPS coordinates to reach us by car. We have a dining room for each room ( Daisy and Lily), where it's possible to have the breakfast and, upon reservation, the dinner. I recently stayed here with my boyfriend for 2 nights. This property was great! The owners were very welcoming and helpful the entire time. The first night there, we were unsure of where to eat for dinner in Siena and the owner printed out a list of restaurants for us to choose from as well as showed us the best place to park. The home is very clean and well kept. The breakfast was to die for. The dinner they prepared for us was also amazing. It was great to try a real home cooked Italian meal with all fresh ingredients. The views from the home were also incredible. We would definitely stay here again if/when we come back!